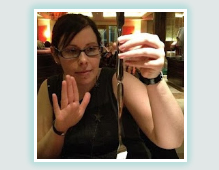 I’ve blogged before about my complicated relationship with exercise. Well, actually, it’s not all that complicated – I don’t enjoy exercise, but I do it because of my weight issues, plus the general benefits it has on my health. I’ve tried so many different forms of exercise, including some of the more faddier ones like Zumba and Bokwa, neither of which I was very impressed with. But, finally, I think I might have found one I actually enjoy. As part of my Ladies’ Circle groups’ calendar of activities for this year, we were supposed to be doing a pole dancing class, but try as I might, I couldn’t find a local class. 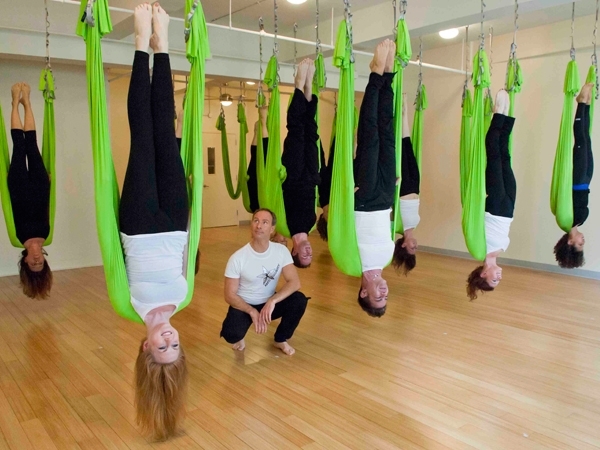 One of my friends suggested we try anti-gravity fitness instead, so I booked us in. I enjoyed it so much I booked myself a fairly pricey four-week course (four one-hour sessions), promising myself that if I liked it, I would do a four-week course from time-to-time to break up the monotony of going to the gym. I’m already mulling over booking myself another course for as soon as this one finishes. Anti-gravity fitness was devised by Christopher Harrison, who’s some big cheese in the Cirque de Soleil. 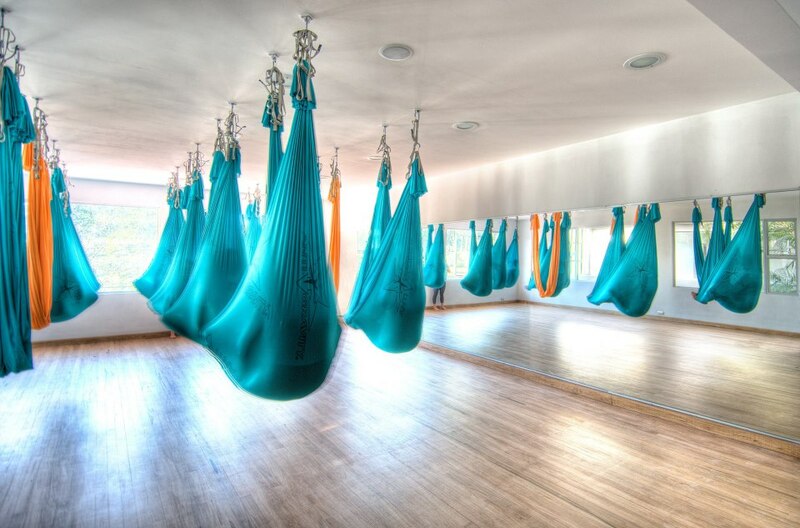 The exercise is a combination of yoga, pilates and acrobatics, all performed using the Harrison Hammock®. Of course there had to be a trademark somewhere in this – it’s a money-making fitness craze, after all. You can actually buy one to install at home, which would be awesome, but I’m scared it would pull my whole house down. Having a knee injury and a birth defect in my lower spine, I tend to be quite cautious about what my body can do. I’m terrified of injuring my knee further, or throwing my back out, something which can be done by the smallest of gestures (once, by a sneeze) and which leaves me in agony for days. But the anti-gravity fitness classes have got me feeling a little bit more confident with my abilities, and a bit more willing (although I do still chicken out sometimes) to try something new and challenging. 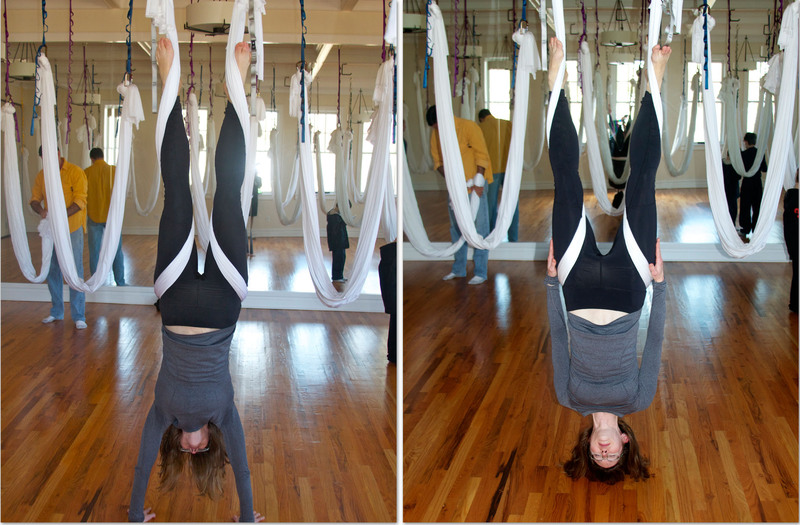 At the start of every class, we climb into the super-strong anti-gravity hammock and get into our womb poses (see the top picture). At my first class with the Ladies’ Circle girls, I arrived late, and the girls were already in their wombs, looking for all the world like a load of bright purple alien cocoons. It was a little unnerving! You sit entirely encased in your hammock, soles of the feet together. Some people like to swing, others don’t. Personally, I like to gently swing from side to side as I hang there, leaving the stress of the day far behind. This decompresses my poor old spine like nothing else I’ve ever tried. Being in a seated position, but without all your weight pressing through your lower spine, feels incredible to someone who suffers from lower back pain. After the initial relaxation, my instructor tends to like to get us flipped upside-down for the first pose of the class, usually in a variant of this move. The first time I attempted this, I thought I was never going to do it. In fact, I didn’t, my bad knee wasn’t quite flexible enough to get into position, and I felt too panicked about leaning further backwards to help it along. At my second class, and feeling a bit braver, I did it, and I felt a sense of accomplishment that I’ve never experienced before. At the class last night we had a new girl who attended, and when the instructor flipped herself into this pose, I sneaked a look at the new girl’s face, and her jaw was just about down to her chest. She looked horrified. Yet, a few minutes later I was giving her an upside-down round of applause as she swung down to join us. The first time you go upside-down, it feels like quite a lot of pressure on your head, and a couple of times I’ve had to come back up because the feeling was so intense. But traditional yoga maintains that inversions are the most important poses, as they stimulate blood flow to the head and brain and other internal organs. Yoga teachers claim that the traditional headstand and handstand are the ‘fountains of youth.’ I can’t do a free-standing traditional headstand or handstand, but I can easily flip myself into a handstand using the hammock. The upside-down poses are my favourites. They look so difficult, but using the hammock as a pivot, and being brave enough to allow gravity to do the rest, it is so easy to get yourself into position. You basically just tip yourself backwards, lift up your legs and trust the hammock to hold you in whatever wrap you’re using. Trust in the hammock, and in yourself, is probably the biggest obstacle. There is a bit of a fear that you’re going to fall out of the hammock at first, and I must admit I do still feel a bit like this sometimes when we try something new. But once you’ve realised that the hammock will hold you, this fear does disappear for the most part. To be honest I have more of a fear of accidentally letting rip a huge fart at these classes, at any exercise class in fact. I think I’m scarred from the time I went to a pilates class and another woman in the group did the loudest fart I’ve ever heard. Afterwards, the room was so silent you could have heard a pin drop, and my lungs were bursting from trying not to laugh. I’ve fallen off a gym ball in front of some people before, but I think I might actually be so embarrassed that I’d spontaneously combust if a fart slipped out. This is genuinely more of a fear for me than slipping out of the hammock altogether. So far it hasn’t been an issue, so maybe being upside-down helps prevents attacks of gas. Sometimes I wonder if these thoughts are going through everyone else’s heads in the class, or if it’s just me – the weird tubby girl wobbling about at the back of the class, thinking about farts. 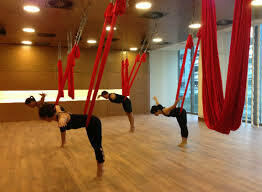 The hammock can be used for other toning exercises too. These are great for anyone who has joint issues, because they support your weight during exercises like these. 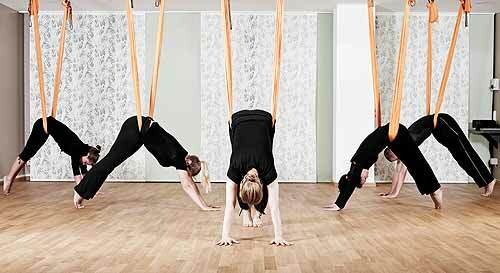 Our instructor has us doing some pretty brutal moves, like pull-ups and planks, all supported by the hammock. After one week’s class, I got down on the floor to do my back exercises the next evening, and couldn’t get back up because my stomach muscles were protesting too much. I genuinely thought for a moment that I’d have to wriggle downstairs like a worm and call 999 for help. Sometimes the hammock does dig into your skin where your entire weight is being supported by it. I was left with a bruise in a rather uncomfortable place (let’s be no more specific than to say it was in the ‘pant zone’) one week, but I am getting used to it. Our instructor refuses to listen to us whining about it digging in, she just tells us we’re getting a deep tissue massage. I am not massively fit, I’m a bit fat and I’m not hugely flexible (apart from my shoulders, for some reason), but I’ve been able to get into poses that I thought would be impossible. If you’d shown me pictures of these moves a month ago and said I would be able to do them, I’d have laughed at you, but I’ve done all of these, although possibly not as well as the ladies in these photos! It’s even inspired me to pick up my old yoga books and work my way through a few lessons of traditional hatha yoga, on which a lot of the poses are based. 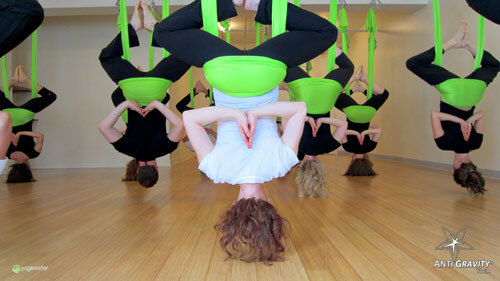 Anti-gravity fitness is kind of faddy, like some of the other exercises I’ve tried. But I think because it is partly based on forms of exercise which have been around for centuries, it feels like it’s rooted in a bit more reality than something like Bokwa, which I’m still genuinely baffled by. I come out of the class feeling a foot taller than I actually am, with a lovely stretched out spine and no joint pain from having bounced around on a treadmill or in an aerobics class. I might not get up as much as a sweat as in the gym, but I do feel stronger, having worked muscles which, until now, I swear have been entirely dormant. I also sleep like the dead after a class. I think I’m going to treat myself to another four week course. 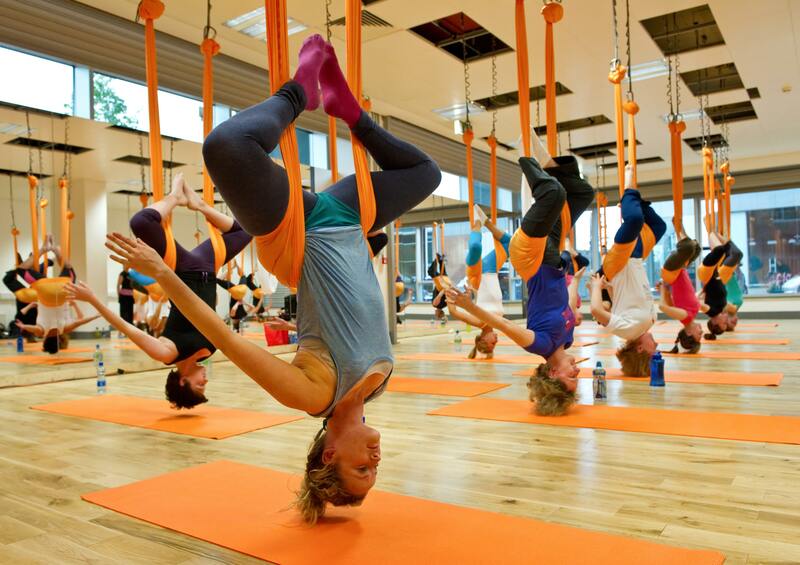 Hanging upside-down like a bat is just way too satisfying to give up…at least until that accidental fart slips out anyway. Enter your e-mail address to follow and receive get of new posts by email.